Studies suggest that both sweet and tart cherries can help prevent attacks of gout, a form of arthritis. Q: I love cherries and have been eating a lot of them this summer. I’ve heard they can help reduce joint pain and arthritis attacks. Is this true? 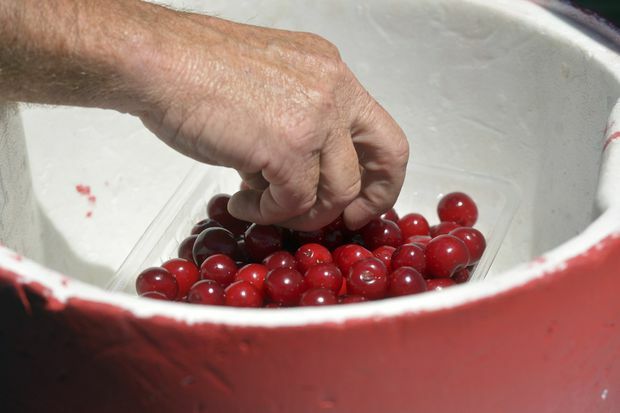 It’s tough to beat the taste and freshness of locally grown cherries. Their short growing season – June through early August – means now is the time to add this nutrient-packed fruit to your menu. The potential health benefits of cherries are impressive. But depending on which type of cherry you buy (or pick) – sweet or tart – you may not be getting the healthy properties you’re hoping for. Sweet cherries (e.g., Bing cherries) have a dark-red to purple skin and a sweet-tasting, juicy flesh. These are the cherries that you’re now probably eating by the handful (or bowlful). Tart cherries (Montmorency is the most popular variety) have a sharp, sour flavour and are best baked in a pie, made into jam, squeezed into juice or eaten dried. It’s this type of cherry that has been most often studied for its potential health benefits. Studies suggest that both sweet and tart cherries can help prevent attacks of gout, a form of arthritis caused by a buildup of uric acid crystals in the joints. Small studies have found that eating sweet cherries (45 cherries) and drinking tart cherry juice reduced uric acid in the bloodstream. Numerous studies have found that drinking tart cherry juice improved postexercise recovery and reduced muscle pain, soreness and loss of strength during long-distance running and cycling and strength training. In one small study, marathoners drank one cup of tart cherry juice or a placebo drink twice a day for five days before the London Marathon, and for two days after the race. Runners who drank the cherry juice recovered more quickly and had lower levels of inflammation, a muscle-damaging effect of strenuous exercise. Tart cherry juice may improve your sleep, too. Research conducted in healthy volunteers found that, compared with a placebo beverage, drinking two tablespoons of tart cherry juice concentrate diluted in water twice daily for one week increased melatonin in the body and improved sleep duration and quality. Studies also suggest that sweet and tart cherries can help lower blood pressure in people with hypertension. These studies were not randomized controlled trials; they were observational in nature. Eating cherries or drinking tart cherry juice has not been proven to treat or prevent any health condition. Even so, cherries add plenty of nutrients and antioxidants to your diet. They’re packed with anthocyanins, natural plant compounds responsible for their bright red/purple colour. Anthocyanins also have potent antioxidant and anti-inflammatory properties, which researchers attribute to many of cherries’ potential health benefits. Both sweet and tart cherries are excellent sources of anthocyanins, but sweet cherries contain more than tart cherries. Tart cherries are also an exceptional source of melatonin, a chemical that, once in the brain, helps controls the body’s internal clock to regulate sleep. Enjoy summer’s sweet cherries by eating them fresh out of hand for dessert or a snack (one cup, with pits, has 87 calories). You can also pit them (a cherry pitter works best) and add to yogurt or blend into smoothies, protein shakes and muffin batters. Or, freeze pitted cherries for later use. Use tart cherries for baking pies and fruit crumbles and making jam. Add pure tart cherry juice to smoothies or add it to plain or sparkling water. Tart cherry juice contains 130 calories per one cup. Drinking too much could lead to weight gain. Cherries are also high in fructose, a carbohydrate that can cause bloating and gas in people with irritable bowel syndrome.